As it stands, the New York Cosmos will have hosting rights for the NASL Championship Final should they prevail in the semi-finals. What isn’t so sure is just where they might host the final. FiftyFive.One has learned that the Cosmos are not going to use their current home at Hofstra University’s James A. Shuart stadium. Instead, they are exploring options that include even selling hosting rights to Indy Eleven. For some time now, the New York Cosmos have been in need of a new home. They currently reside on Long Island in a stadium where they cannot sell alcohol. But scheduling — particularly the last minute scheduling of the post-season — makes the team’s current arrangement untenable. 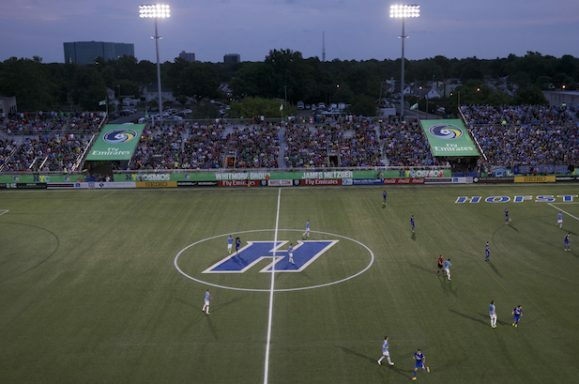 The NASL finds itself in a situation where its flagship team may be unable to host its final. Sources have confirmed that there are many on-going conversations about where the Soccer Bowl might be hosted should the Cosmos win in the semi-finals. One conversation has been with Indy Eleven to possibly sell the hosting rights so that Indianapolis would host the final (should the two teams go through). The Cosmos played a playoff match in 2015 at the Brooklyn Cyclones’ MCU Park, a minor league baseball stadium at Coney Island. Additionally, a source confirms that there are serious negotiations in progress for a move to MCU stadium for 2017. It remains uncertain whether MCU is an option for hosting the Soccer Bowl in 2016. No decisions on the Championship Final are imminent as the league and teams negotiate the various options. While the optics of the Cosmos selling hosting rights to Indy Eleven would be unfortunate, it could be a blessing in disguise. The Eleven have a much better stadium set up and continue to draw large crowds. Indy hosting the Cosmos may well be the league’s best outcome in terms of putting on a memorable show. Update: The previous version of this article mistakenly referred to the Championship Final as the Soccer Bowl.